Make sure your conservatory blinds keep their shape and always look good. As standard, we fit the proven EquiPleat® pleat retention system to ensure that your blinds always look fabulous, retain their shape and operate smoothly. 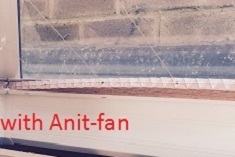 This amazing system is a combination of a ribbon together with tiny plastic tags that are attached to the back of alternate pleats which ensures equal spacing between the pleats, irrespective of the shape or angle of your window. 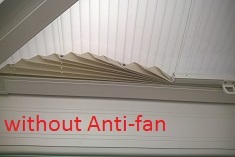 It’s perfect for sloping roofs blinds as it stops the pleats from dropping to the bottom of the blind over time due to the effects of gravity and is a must for all shaped pleated roof blinds to ensure they keep their shape at all times. prevent the pleated fabric from fanning out when the blinds are fully retracted. 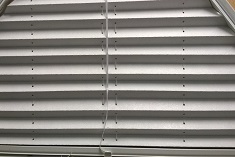 Due to the very nature of pleated fabric, when shaped blinds are fully retracted, the area of fabric that is not sandwiched between two rails has a tendency to what we call “fan out” and therefore will not lay completely flat. 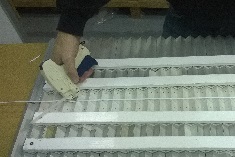 By the ingenious application of a cord/elastic we are able to either completely prevent fanning or to significantly reduce fanning on all shaped blinds depending on the shape of the blind and the stiffness of the fabric.